Section 2. Principal Office. The principal office for the transaction of business of the Association shall be at such address in the County of Miami-Dade, State of Florida, as may be fixed from time to time by the Board of Directors (“the Board”). Section 3. Conduction of Business. When any proposal, motion, or act of the Association requires a vote to pass, it shall be understood that it is a majority vote. Quorums for such voting vary as described in the appropriate section herein. Section 4. Origin and Mission Statement. 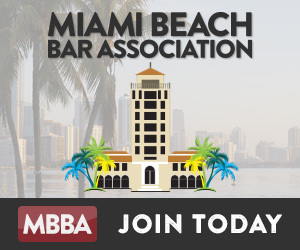 The Association was formed in 1946 as a not-for-profit organization, founded by a group of Miami Beach attorneys with attorney and philanthropist Baron De Hirsch Meyer as its first President. The Association’s mission is to promote respect for the law and the justice system through service to the community and to the legal profession, while encouraging collegiality among and providing Continuing Legal Education (CLE) to our members through monthly seminars, luncheons, and other activities and events. Section 1. Regular Members. Any member in good standing of The Florida Bar, including judges, shall be eligible for regular membership. Only Regular Members shall have the right to serve as Directors, hold Office, or vote in the affairs of the Association. Associate Members may request that the Board allow her or him to run for and hold a Directorship or Office. By unanimous vote of the Board, one (1) Associate Member may be allowed to run for said positions in any given year. Thereafter, that individual may run again for any Directorship or Office without Board approval. Section 2. Honorary Members. Honorary Members shall be attorneys in good standing of her or his respective mandatory bar and elected as such by unanimous vote of the Board. They shall pay no dues. Section 3. Associate Members. Associate Members shall be such attorneys who are authorized or licensed to practice law in, and are a member in good standing in the mandatory bar of, another State or country, but are not members of the Florida Bar. Section 4. Affiliate Members. Affiliate Members shall be non-lawyers accepted for membership by the Board. They may not be Directors. Section 5. Admission for Membership. Any person desiring to become a member shall submit a written application on a form and with the dues prescribed by the Board. Section 6. Suspension or Termination of Membership. If a member resigns, is suspended, or is disbarred from membership by her or his state bar association, membership in the Association shall be automatically terminated, without any further action by the Board. Such person may be readmitted to membership with proof of reinstatement as a member in good standing of her or his respective bar association. The Board may, by vote, suspend or terminate the membership of any member who is found to have engaged in conduct which tends to bring the legal profession or members into disrepute. Prior to any such vote, the member shall be notified, and afforded the opportunity to be heard by the Board at its next regular or special meeting. At such meeting, the member may appear in person, with or without counsel. Section 1. Establishment of Dues. Annual dues for regular members, associate members, and affiliate members, shall be fixed by the Board from time to time by vote. Section 2. Payment and Waiver of Dues. Dues shall be payable on January 1st of each year. First year admittees to The Florida Bar shall enjoy a waiver of dues for the first year of membership. Members who serve on active duty with the armed forces of the United States shall continue as members without the payment of dues during her or his active duty and the balance of the fiscal year of her or his separation from same. The Board may vote to remit or waive the dues of any member, in whole or in part. Section 3. Non-payment of Dues. If a member shall fail to pay dues on or before April 1st of the year in which they are payable, such member shall automatically be suspended from membership in the Association. She or he shall be notified and afforded the opportunity to pay her or his dues. In the event such member shall not then pay dues within thirty (30) days after the notice of suspension, membership shall automatically be terminated. A former member who ceased to be member by reason of non-payment of dues, shall be fully reinstated as a member upon payment of dues for the year in which reinstatement is sought. Section 1. Annual Meeting. The Association shall hold an annual meeting of its members and guests in the County of Miami-Dade, State of Florida, in the month of December of each year, the date to be fixed by the Board. In addition to other business, at that meeting there shall be an installation of those Officers and Directors of the Board elected by the Regular Membership. A Quorum to conduct the annual meeting shall consist of 30% of the Regular Members as determined from the current roster prior to the meeting. A quorum is not required to conduct the installation ceremony. Section 2. Regular Meetings. Regular meetings shall be held at times to be determined by the Board, and when so fixed and made known to the membership, no special notice of the purpose of such meeting shall be required. A Quorum to conduct regular meetings shall consist of 20% of the Regular Members, as determined from the current roster no more than thirty (30) days prior to the meeting. Section 3. Special Meetings. Special meetings may be called by the President or upon the request by a vote of the Board, after written notice of not less than five (5) days. Each notice of a Special Meeting shall state the purpose of such meeting. Section 1. Election of Officers. The Regular Members in good standing shall elect annually a President-Elect, who shall become President as of January 1st of the year following the term as President-Elect. In addition, the members shall elect at least one (1) First Vice President, and may elect a Second, and even a Third Vice President, and also a Secretary, a Treasurer, and an Historian, as well as members to the Board, the latter not to exceed sixteen (16) in number. All such persons shall be elected for a one (1) year term commencing January 1st of the year following her or his election. No member shall be eligible to serve as an Officer without first having served at least one (1) year as a Director within the immediate three (3) years preceding the year in which the member seeks to serve as Officer, and chaired at last one (1) committee. If an Office or Directorship only has one nominee, as determined by the Nominating Committee, that nominee shall be appointed to that Office by the Board to serve as described above. Section 2. Duties of the President. The President shall conduct and preside at all meetings of the Association and its Board. The president shall be the official spokesperson for the Association and its Directors. Unless otherwise provided herein, the President shall appoint all committees, be the Chief Executive Officer, and shall be vested with full power to exercise whatever activities may be necessary or incident to the full exercise of any power bestowed upon the President by the Board consistent with the provisions of these By-Laws. It shall be the duty and obligation of the President to provide leadership on the accomplishment of the aims and purposes of the Association. Section 3. Duties of the President-Elect. It shall be the duty of the President-Elect to render every assistance and cooperation to the President and provide the President with the fullest measure of counsel and advice. The President-Elect shall be familiar with all activities and affairs of the Association and shall have such other duties as may be assigned by the President. In the event of the President-Elect’s death, disability, or resignation, the Board shall select an acting President- Elect to hold office until a successor shall have been elected by the Regular Members in good standing at a special meeting held pursuant to the direction of the Board. Section 4. Acting President in the President’s Absence. In the event the President is absent or unable to act, the President’s duties shall be performed by the President-Elect; and in the event of the death or resignation of the President, the President-Elect shall serve as President during the remainder of the term of office thus vacated and then shall serve as President for the term for which elected. In the event of the death, disability, or resignation, of both the President and the President-Elect, the Board shall elect an acting President who shall hold office until December 31st of the year in which such vacancy occurred. The Board shall also elect an acting President-Elect who shall hold office until a special election has been held as provided in Section 3 above. Section 5. Prohibition against Service on the Board by the President, President-Elect, or as an Officer by an Immediate Past President. In the event that a member of the Board shall become either the President or the President-Elect, such member shall not serve on the Board except as President or President-Elect and the Office of that member shall become vacant and be filled in accordance with the provisions of this Article. An Immediate Past President, may serve on the Board indefinitely, but shall not hold an Office for at least two (2) years following her or his Presidency. Section 6. Duties of the Vice President(s). The duties of the Vice Presidents will be to render every assistance and cooperation to the President, and the highest ranking Vice President shall act in the absence of the President and President-Elect. Similarly, if the highest ranking Vice President is absent together with the President and President-Elect, then the next highest ranking Vice President shall so act; if they are not available, then these Officers will act, in this order of availability: the Secretary, the Treasurer, and the Historian. Section 7. Duties of the Secretary. The Secretary shall keep an accurate written record of all meetings of the Miami Beach Bar Association and of the Board, be responsible for maintaining the permanent files of the Association, and shall Chair the Newsletter Committee, if convened by the President, and oversee its publication, if any is promulgated. Section 8. Duties of the Treasurer. The Treasurer shall be the custodian of all funds of the Association, shall supervise the financial records maintained and the financial actions taken, periodically review the financial condition of the Association and make reports to the Board at each regular monthly meeting of the Board, and to the membership at such intervals as the Board shall direct. The Treasurer shall be responsible for contacting the Accountant of the Association (if one is utilized) and providing all financial information necessary to file the annual income tax returns, and shall perform such other duties as may from time to time be prescribed by the Board. The Treasurer shall be responsible for the collection of dues from the membership, and shall keep a record of the names, addresses, and other contact information of all the Members. Section 9. Duties of the Historian. The Historian shall be responsible for collecting, maintaining and preserving any photographs, videos, digital media, published articles, and any other records reflecting the activities of the Association and its membership. Section 10. Vacancies of Offices. Any vacancies of any elected Office, except as may be otherwise herein provided, shall be filled by the Board. Any such person selected by the Board, shall hold office until December 31st of the year in which the vacancy occurred. Section 1. Election and Composition of the Board; Quorum for same. The property and business of the Association shall be managed by a Board no greater in number than twenty-five (25), and no less than fifteen (15). The same shall be composed of the President-Elect, all elected Officers, the Immediate Past President, and no less than six (6) or more than sixteen (16) Non-Affiliate members elected from the general membership. Each person elected to the Board shall serve for a period of one (1) year. In the event of a vacancy on the Board, the same shall be filled by a vote of the Board at a meeting called for that purpose, at which a quorum, as defined in Section 1(b) below is present. A Quorum of the Board shall be eight (8) members. But a smaller number may adjourn a meeting not attended by a quorum to a later specific date, with notice thereof to all members of the Board. Minutes of the business conducted at any meeting of the Board shall be given at the next meeting of the Board as part of the agenda. Each member of the Board shall serve on at least one (1) Standing Committee during her or his term of office. Section 2. Terms of Office. The term of office of those elected as Directors shall be one (1) year. The Directors shall take office on January 1st of the calendar year following her or his election. No Member shall be eligible to serve as a Director without having first served on a Standing Committee within the three (3) years immediately preceding the year in which the member seeks to serve as a Director. Section 3. Removal of Directors. The absence of a Director from four (4) cumulative meetings of the Board during any annual term of office without an excuse acceptable to the Board, may result in removal from office, such office becoming vacant at the conclusion of the next scheduled meeting of the Board. Any Director may be removed for cause by the affirmative vote of two-thirds (2/3) of the entire Board, at a meeting specially called for that purpose. Prior to any vote by the Board, the Director sought to be removed shall be notified in writing and afforded the opportunity to be heard by the Board at the meeting at which such proposed removal is to be heard. At such meeting, such Director may appear in person, with or without counsel. Section 4. Vacancies on the Board. Any vacancies on the Board shall be filled by the Board for the remaining period until December 31st of the year in which the vacancy was created. In the event a Director is elected to an office, her or his directorship shall become vacant upon assuming the office to which he or she has been elected. Unless otherwise directed by the Board, the Board shall meet monthly at such time and place as the Board may deem appropriate. Any meeting may be held in person, by telephone, or virtually via electronic means, the internet, or any other current technological media, as determined by the President. Special meetings of the Board may be called by the President, and shall be called by the President at the request of three (3) Directors. Reasonable notice shall be given of all special meetings. Notice shall specify the matters to be considered at such special meeting, and such notice may be written or verbal, by any media. Section 1. Procedure for Nomination. On or before May 1st of each year, the President-Elect shall appoint a Nominating Committee consisting of five (5) Regular Members as follows: any Past President, two (2) Directors, and two (2) Regular Members. Any member of the Nominating Committee may be nominated by that Committee to serve as an Officer or Director for the year following that member’s service on the Committee, as provided in Section 1(b) below. The Nominating Committee shall submit to the Board, no later than the Board’s regularly scheduled June meeting, the Committee’s recommendations for the nomination of all Officers and Directors. The Board may either approve, or modify the Committee’s recommendations. The Committee’s recommendations, as approved or modified by the Board, will be mailed by the Secretary to the general membership no later than July 1st of each year, together with a notice that any Regular Member may, within thirty (30) days of the date of such notice, offer her- or himself as a candidate for election as Officer or Director. Such notice shall further set forth the requirements for eligibility to be nominated as an Officer or Director as provided in these By-Laws. All such additional nominations shall be submitted to the Board in writing specifying the Office or Directorship sought, and containing the endorsement of at least two (2) other Regular Members in good standing. A person nominated for more than one Office, including that of Director, may accept the nomination for only one Office or Directorship. Section 2. Procedure for Elections. If no additional nominations are submitted beyond one candidate per Office or Directorship, and the number of nominees does not exceed the total number of Directors or Officers allowed, then the Nominating Committee’s recommendations (“slate of candidates”) shall be accepted and those Officers and Directors shall be automatically appointed without need of election. b(1). In the event more than one (1) individual is nominated for any one office, or more than sixteen (16) nominations are submitted for election to the Board, then the Secretary shall, no later than September 1st, prepare and mail to the voting membership, a ballot for the election of those opposed Officers and/or Directors, listing the names of all persons duty nominated. Each ballot shall contain instructions: (1) to vote for no more than one (1) person for each Office; (2) to vote for no more than sixteen (16) members for the Board; (3) to return the ballot to the Secretary no later than the date of the regularly scheduled general membership meeting in October. b(2). In the event of a contested election as provided in Section 2(b)(1) immediately above, the President shall appoint an Election Canvassing Committee, composed of three (3) Regular Members in good standing, who have not been nominated for either an Office or Directorship, and whose duty it shall be to see that the election of the contested Officers and Directors is carried out according to the terms and conditions of these By-Laws, Election to each office or position shall be by highest number of votes cast. The Election Canvassing Committee shall collect, determine the validity of and count all ballots received, and shall certify and report the results of the election to the Board at the meeting regularly scheduled for November of each year. Budget Committee. This committee shall prepare a budget of the estimated income and expenditures of the Association for submission to and approval by the Board, no later than the October Meeting every year, and shall also submit such other recommendations on finance as may be requested from time to time by the Board. This Committee shall be chaired by the Treasurer and have at least two (2) other Regular Members to be appointed by the President. Bench and Bar Committee. This Committee shall facilitate a relationship between the membership and the judiciary, especially the sitting Miami Beach Judge. This Committee shall also be responsible for organizing at least one judicial happy hour event per year. Further, the Bench and Bar Committee will assist the judiciary when comments are sought concerning administrative rules or input from local bar associations. This Committee shall be chaired by an Officer or a member of the Board and appointed by the President. Membership Committee. This committee shall be charged with the duty and responsibility of obtaining new members and performing the duties elsewhere prescribed herein. This Committee shall be chaired by an Officer or member of the Board and appointed by the President. Law Week Committee. This Committee shall be charge with the duty and responsibility of organizing the Law Week events. This Committee shall be chaired by an Officer or a member of the Board appointed by the President. Newsletter Committee (optional). This Committee, if convened, shall be charged with the duty and responsibility of preparing an optional monthly Newsletter in digital/electronic format (e.g., webpage or e-mail). This Committee shall be chaired by the Secretary. CLE Speakers Committee. This committee shall be charged with the duty and responsibility of obtaining CLE speakers for monthly meetings. This Committee shall be chaired by the First Vice President, or may be an Officer or Director appointed by the President. Pro Bono Legal Clinic Committee. This Committee shall be charged with the duty and responsibility of managing the legal clinic, including scheduling of volunteer members, updating legal information, and general organization. This Committee shall be chaired by an Officer or Director appointed by the President. Public Relations Committee. This Committee shall be charged with the duty and responsibility of informing the media and the general public, in a timely manner, of the activities and accomplishments of the Association, and of any awards or commendations received by the Association. This Committee shall be chaired by a Vice President or other Officer or Director appointed by the President. Social/Networking Committee. The Chair of this committee may be appointed by the President and does not have to be chaired by a lawyer member. This committee will work solely to assist and coordinate social and networking events working with other local community groups to promote relations in the community between members in non-CLE related events. This includes any coordinated Happy Hours, sporting events or family activities. Website Committee. The Chair is to be appointed by the President with one other regular member to assist. The Chair will coordinate with the Webmaster (retained private contractor) to make monthly changes to the website, including but not limited to CLE events, luncheons, special activities, membership directory online, pictures of events, Newsletter (if any), etc. Responsibilities may also include drafting and/or sending out broadcast e-mails for events. Section 2. Ad Hoc Committees. The President may create any ad hoc committee she or he deems necessary for the conduction of the Association’s affairs, and shall appoint its Chair and members. Section 1. Statements by the President. The President, or her or his designee, shall express the policy of the Association to the public at large, as determined by the Board. No other members or employees of the Association may represent the Association or a Committee unless specifically authorized by the Board. Section 2. Statements by Other Members. Any member who, when making a public utterance, permits himself to be identified as having an official connection with the Association or one of its committees, shall, if the policy of the Association on the subject matter of the utterance has been determined by the Board, fairly state that policy and, if he or she expresses views at variance with it, clearly identify the variances as her or his personal views only. If there has not been or if the member has no knowledge of any such policy determination, the member shall nevertheless identify the utterance as her or his personal view. Section 1. Composition of the By-Laws Amendment Committee. The President shall appoint a By- Laws Committee consisting of three (3) Non-Affiliate Members, chaired by the President-Elect, whose duty and responsibility it shall be to review the existing By-Laws of this Association and make recommendations to the Board as to the need for any revision or amendment. This Committee shall be appointed at least every five (5) years. The Board shall act on any proposal submitted to it by the By- Laws Committee in accordance with the provisions of this Article. Section 2. Proposals for Amendment. Any Regular Member in good standing may submit a proposal for amendment to either repeal, rescind, alter, or amend these By-Laws. Such proposal must first be in writing and presented to the President. The President shall not await the five-year review period, and shall immediately appoint a By-Laws Committee, consisting and functioning as described above in Section 1. Section 3. Procedure for Amendment. If the Board adopts the recommendations of the By-Laws Committee, and such recommendations are for approval of the proposal for amendment, then the Secretary shall cause notice of such proposal for amendment to be sent to the voting Regular Membership by including the same in the next issue of any Newsletter (if any), posting on our website, and/or via e-mail. The notice shall identify by article(s) and sections) the By-Law(s) which is/are the subject of the proposal for amendment, and shall state in general terms the nature of the proposal. Section 4. Additional Proposals, Voting Requirements, & Effective Date. Thereafter each such additional proposal for amendment shall be submitted to the Board by the same procedure described in Section 3 hereof, and to the Regular Members at the next regular meeting and shall be voted on separately, in person, or virtually by other media. When approved by a vote of the members at such meeting, provided there is a quorum of at least twenty percent (20%) of Regular Members in attendance at such meeting, each approved proposal shall become effective immediately. Section 5. Initial Rejection by the Board. In the event any proposal for amendment shall be submitted to the Board and shall not be approved, then upon the written demand of not less than twenty (20) Regular Members filed with the Secretary, such proposal for amendment shall be submitted to the Regular Membership after notice as provided in Section 3 hereof and, if approved by the Regular Members in the manner provided in Section 4 hereof, shall become effective immediately. Section 1. Votes by a Member with a Conflict of Interest are Void. It is the policy of the Association that no member shall vote upon any matter coming before a meeting of the Association, the Board, or any Committee, if that member has any substantial or significant interest, financial or otherwise, direct or indirect, in the outcome, such that the person cannot fairly be said to be disinterested and able to act in the best interest of the Association. The member shall disclose this interest or connection; regardless, even if discovered and reported to the Board otherwise, any vote of any member cast contrary to the terms or spirit of this By-Law shall be void and the tally of the vote will be taken as if she or he had not voted. Section 2. Members’ Duty to Disclose. It shall be the duty and obligation of such member to disclose any such conflict of interest before participation in debate or deliberation on any such issue or matter, even if the member does not intend to cast a vote; so that other members participating in the deliberations shall be aware of that member’s interest. Section 3. Prohibition against Commercial Dealings without Disclosure. Without prior full disclosure of her or his interests and connections to any transaction to, and authorization by, the Board, no member shall, directly or indirectly, or through any entity, family member, or intermediary purchase, rent, lease, contract, or sell any realty, merchandise, or service to, from, by, or with the Association. The fiscal year of this Association shall be the calendar year. The Original By-Laws were adopted on October 18, 1994 and took effect January 1, 1995.